From 1883, the Manchester and Salford Boys' and Girls' Refuges operated a children's seaside convalescent home at Lytham in Lancashire. The home The home provided a short-term change of scene, with healthy air and food, for 'poor and delicate city children'. 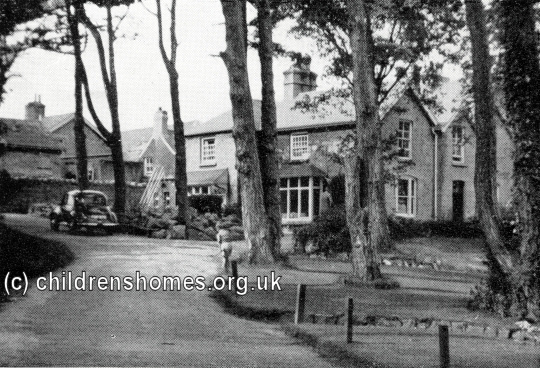 In 1915, the home moved from Lytham to larger premises at 'Tanllwyfan', 510 Abergele Road, Llysfaen, near Old Colwyn, Carnarvonshire. The property's seven acres of land included a garden, playing fields, and a small farm where vegetables were grown and cows, pigs, chickens and a donkey were kept. The home could accommodate up to 50 children, aged from 6 to 16 years. 1. Poor children who are duly recommended as needing a change of air are received fro a week or longer, according to circumstances, preference at all times being given to delicate cases resident in the district of Manchester and Salford; boys from 6 to 11, girls from 6 to 16 years of age. 2. A child afflicted with and infectious complaint is on no account admitted, nor any child in a helpless condition; all cases must be recommended on these forms and passed by the Committee of the Institution. 3. When there are vacancies in the Home, cases may be received from other towns, at the discretion of the Manchester Committee. 4. The child must be clean in person, and be provided with a complete change of underclothing and a second pair of boots. 5. The parents of friends of the child are expected to pay return rail fare and to make a weekly payment according to circumstances. At the outbreak of the Second World War in 1939, the home housed children with disabilities who had been evacuated from the Refuges' Bethesda Home in Manchester. From 1953 to 1958, the premises reverted to use as a convalescent home, then was used as general residential accommodation by the charity. Tanllwyfan no longer stands and the site is now covered by modern housing.